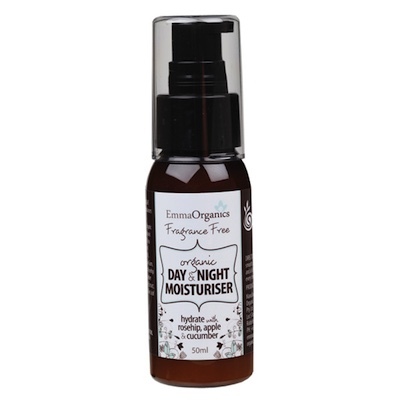 Carrot, Rose hip, Chamomile and Aloe vera - for every day environmental protection and repairing of the skin. Avocado, Shea Butter & Macadamia oils - to hydrate, restore and prevent moisture loss. INGREDIENTS: Purified Water (Aqua), Organic Aloe Vera (Aloe barbadensis) Juice, Organic Safflower (Carthamus tinctorius) Oil, Organic Cocoa (Theodrama cacao) Butter, Organic Shea (Butyrospermum parkii) Butter, Organic Macadamia (Macadamia ternifolia) Oil, Organic Coconut (Cocos nucifera) Oil, Organic Glycerine, Glyceryl Caprylate, Cetearyl Olivate, Sorbitan Olivate, Xanthan Gum, Parfum (Natural Preservative), Organic Rosehip (Rosa canina) Oil, Organic Avocado (Pesea gratissima) Oil, Carrot (Daucus carota sativa) Oil, Organic Coconut (Cocos nucifera) Water, Tomato Seed (Solanum lycopersicum) Oil, Natural Vitamin E (Tocopherol), Organic Olive Leaf (Olea europaea) Extract, Organic Apple (Malus domestica) Extract, Organic Cucumber (Cucumis sativus) Extract, Organic Rosemary (Rosmarinus officinalis) Extract, Citric Acid.